While it is not ever my first choice, hydrating droopy vegetables is worth the effort if your vegetables aren’t too far gone. I am not talking about trying to save rancid moldy vegetables but rather the carrots I bought yesterday that were crisp, fresh and gorgeous but somehow, within a 24 hour span in the fridge, have gone wilty, maybe even beyond wilty but nowhere near rotten. It pains me to throw out food. 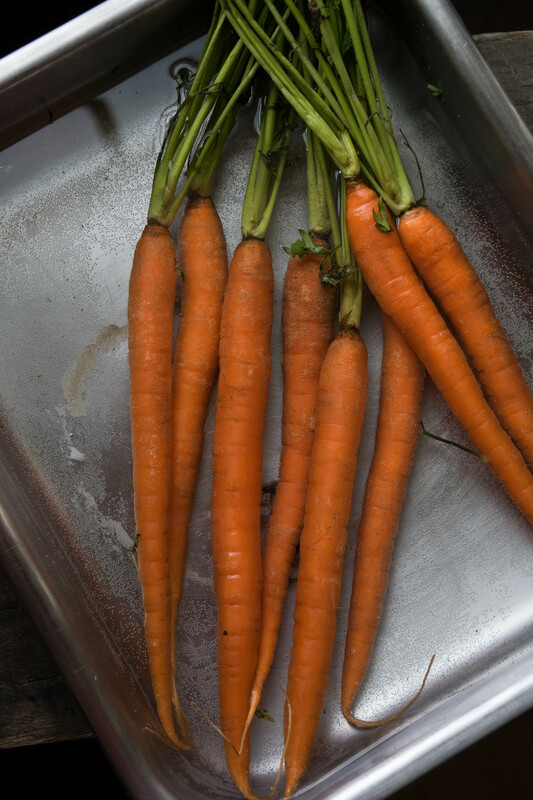 Generally I would make a stock with vegetables like this just to use them up but I was really counting on this particular gorgeous bunch carrots for dinner. I wanted to roast them in a high heat oven, taste their sugary goodness alongside a perfect roast chicken, but not now. At the end of an hour in a hot oven they would be nothing but mush. Then it dawned on me. Often times during the heat of summer, especially during a dry spell, vegetables growing in the garden sometimes go limp before I can get water to them. Rarely is it fatal as long as it hasn’t been days on end and often after a long cool drink they perk right back up fresh as a well watered daisy. So I gave it a try. It’s not like the carrots are dead, they are a root vegetable after all. Why wouldn’t they still be alive and kicking? So I put them into a hotel pan, added good fresh spring water, not chlorinated tap water, and let them sit. Within an hour they had perked up, after two they were gaining strength, and after four hours in a spring water bath they were as good as new, or so I hoped. Before I got too excited I want to taste one. I want to be positive they aren’t watery tasteless carrots and that they are worth my effort to cook them. I bit into one. Low and behold, they were good enough. While I am not sure they were as good as the fresh, first day carrots I bought to be fair I didn’t taste them until I re-hydrated them. Nevertheless they were acceptable and after I roasted them they were even better. Thank for sharing such a great tip. I’ve used this many times when setting up a veggie tray. Cutting up the carrots and celery a day ahead and storing them in cold water until ready to serve. They’ve always tasted fresh. This also works for fresh ginger. We prevent our ginger from drying out by keeping it soaking in a mason jar in the refrigerator. Great trick! I never like throwing away good food either. Also when I decide to save “old” (not rotten) vegetables to make a broth but don’t have time time and/or other ingredients, I throw them in the freezer. You might lose a little flavor but at least you aren’t wasting the whole vegetable! I just roast them in their wimpy state, and they come out fine. Good lesson though! Interesting post. And if you trim off the tops the carrots will not wilt as fast. I have found (thanks to a produce guy at a GOOD market) if you soak for 10m or so in just warm water (the veg takes it up sooner) then drain and add cold, it works somewhat faster.